Here is a new tool to help educate people about developing life within the womb. It is a set of nine 16″x 20″ color posters of the unborn child, one for each month of pregnancy. The ninth poster portrays newborn babies. Accompanying text explains the development of the baby, which is depicted in pastel paintings. The Respect Life Committee of the Archdiocese of Baltimore produces the posters. Over 500 sets have already been sold and are being used in many applications, including crisis pregnancy centers, churches, doctors’ offices, public schools and hospitals. They are even being made into billboards. 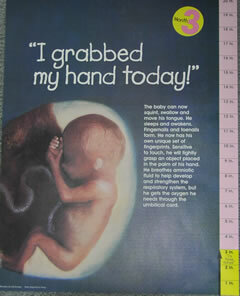 The posters have been sent to pro-life groups in various countries, including Australia, Ireland and South Africa. An additional 24″x 30″ poster depicting all nine images is also available. The posters have been printed in English and Spanish. Romanian and French editions are in the works. Additional languages will be printed upon request.